I think we've all been in this position. You're either shopping in a store or online and you have X amount of money to spend. You fill up your cart with the stuff you want and your lemmings are fulfilled,, but you have room to buy one more polish. What do you do? This can be a frustrating situation at least for me. It's nail polish and being as picky as I am I don't want to just pick up any random thing. This happened to me recently when I was shopping online with Ulta. I filled up my cart with all the polishes I wanted and I knew I could get one more. This is where other bloggers can help. I always will go through blogs or Flickr photostreams to help me make a decision. 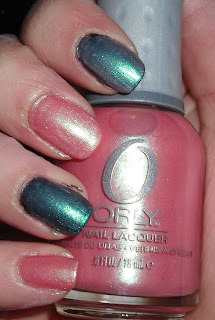 I came across Scrangie's post "More Random Polishes I Like" which lead me to purchase Orly Opal Hope. I alternated Opal Hope on it's own then over black. At first I would of suspected this color be sheer, but it's not it is quite opaque after 2-3 coats. I also didn't expect much from it. It seemed to be light pink shimmer, but I know if it was on Scrangie's random polishes she likes list it had to have some special quality. This is a beautiful duochrome! That sadly this photo doesn't do it justice. It's pink shimmer that flashes sea foam green and gold. It also has these little micro glitters in it that are light pink and gold. When it's layered over black it's a shimmery sea foam green that flash a bit blue and purple. It seems like such a simple polish, but it has a lot to offer. I love duochromes. I know this isn't like the SH HD's or the new Orly Cosmix, but I consider any duochrome a real treat since they are not the most common of polishes in the nail polish world. I think this looks great on it's own or over another color. I'm curious to try it layered over colors to see how it would look! I recently bought a duochrome called Glamourous Purple by Koh, amazing really. I like the duo of colors - such a feminine color! Great review! Love the color alteration idea these colors look great alone but they really are amazing together! congrats on winning ice queen's giveaway! love duochromes.... um glacier bay blues, sally hansen's prisms line, and obviously orly's space cadet are some of my favs, but I have more. That really is a pretty color! I love Scrangie's blog - though it always makes me want MORE! So does this post! ACK!